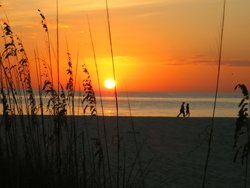 Where is the best Florida beach? Try the Gulf Coast for your Florida beach vacation. I am constantly asked where to find the top Florida beach. Finding the best Florida beach for your Florida beach vacation should not be a hit-or-miss thing. The Gulf Coast tops our recommendation for the best Florida beaches. People want to know where to go for the best sand, the most seclusion, the most fun, ease of parking, closeness of local beach bars, upscale places to eat, inexpensive accommodations, full-blown luxury amenities...well, you get the idea. I'm sure if you posed this question to a group of travel writers, Internet bloggers, marine biologists, or college fraternity brothers you'd get quite a varied response. Each of us has our expectations about what lifestyle we want to pursue on the beach and each of us will have our biases of what we absolutely DO NOT want. To me, the best beaches in Florida for quality lifestyle or a memorable Florida beach vacation are found on the Gulf Coast...on the southern part of the Pinellas County Barrier Islands, particularly Madeira Beach, Treasure Island Beach, St. Pete Beach, and Pass-A-Grille Beach. I can always find a large area for myself to read and snooze. * Here's an interesting local fact: The 14-mile barrier island, from Clearwater Pass (the waterway between Sand Key Park and Clearwater Beach) down to John's Pass (the waterway between Madeira Beach and Treasure Island Beach), with all of these little community beaches in-between is called Sand Key. 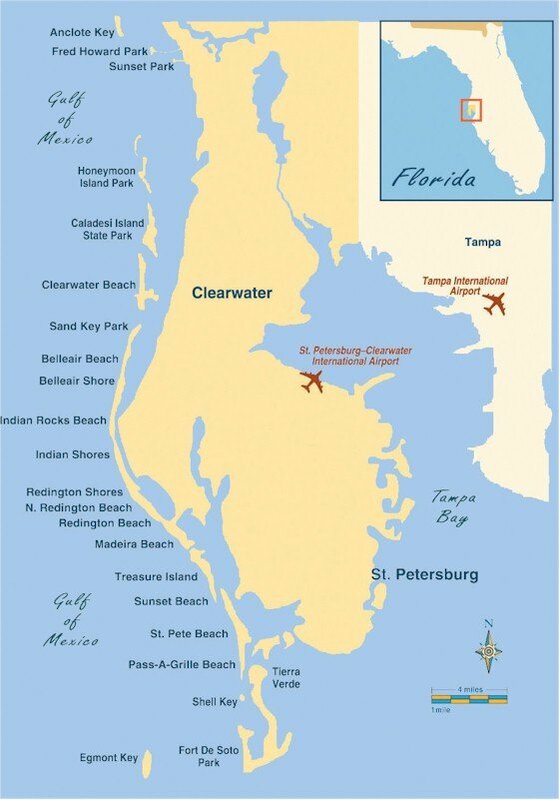 However...when locals use use the term "Sand Key" it is in reference to the northern tip right above ritzy and privatized Bellair Beach where Sand Key Park edges against Clearwater Pass. Even if you decide you do not want to stay on one of the Gulf Coast barrier islands, it's no problem. They are all within easy driving distance (10 miles) from the quaint and beautiful city of St. Petersburg ...known as the Sunshine City and Gateway to Florida's Gulf beaches. I've walked these beaches, swam in the Gulf off all of them, and snoozed on them. I've eaten at great restaurants and had a cold one on the patio decks of the local hangouts. I like the different personalities of each Gulf Coast beach community, the uncrowded parts of each, the variety of activities, and the lazy feeling you get when you close your eyes and just listen to the waves come in. In your own hunt for the best Florida beach, you'll need to establish your own criteria. It's helpful to zero-in on your lifestyle where you are, right now. A young professional person will no doubt have a completely different idea about the best Florida beach for them as compared to a retired nurse. The best Florida beach is the one where you feel most centered, where you feel you're getting the most value, and where you experience the romance, the fun or the relaxation that you're looking for. To me, the Gulf Beaches Barrier Islands give you the best chance to fulfill everything. Do you want to retire in Florida? What is The Florida Beach Life? Do I need to worry about Stingray Season on the Florida beach?